Lion Corporation (President: Itsuo Hama) announced today the release of the “Tomatosu+Milk Peptide Seikatsu” health food supplement on Thursday, May 17, 2012. Featuring tomato vinegar and milk peptides, which are nutrients extracted from milk, the tablet-type supplement is easy to take as it is free of the acidity of vinegar. “Tomatosu+Milk Peptide Seikatsu” will be available only via theLion Wellness Direct mail-order (direct-to-consumer) shopping site. In recent years, various studies have confirmed the beneficial attributes of tomatoes. Tomatoes have long been eaten as part of a healthful diet, and vinegar made from tomatoes contains such health-promoting nutrients as glutamic acid and γ-Aminobutyric acid (GABA). Based on this, Lion has promoted the study of tomato vinegar since 1987 and has commercially developed unique tomato vinegar-based beverages. By powderizing its proprietary tomato vinegar to create a concentrate and adding milk peptides (nutrients extracted from milk) Lion was able to develop tablets that can be easily taken even by those who do not like the acidity of vinegar. 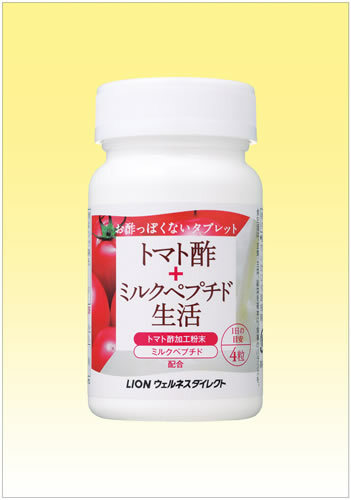 “Tomatosu+Milk Peptide Seikatsu” tablets will be released on the Lion Wellness Direct mail-order shopping site on Thursday, May 17, 2012, as a product that supports people concerned about their lifestyle habits. Tomato vinegar is produced from fresh tomatoes through the acetate fermentation process and contains a rich array of nutrients, including glutamic acid, such amino acids as GABA and the mineral potassium. Milk peptides derive from milk proteins and are composed of three amino acids (methionine, lysine and proline). Studies have shown peptides’ effectiveness in helping to maintain health. By combining milk peptides with tomato vinegar, this product gently supports everyday health. “Tomatosu+Milk Peptide Seikatsu” contains 250 mg of milk peptides per four tablets. * “Milk Peptides MKP®” developed by Morinaga Milk Industry Co., Ltd. Coating on the tablets masks the acid taste of vinegar. Take around four tablets a day with a glass of water without chewing.